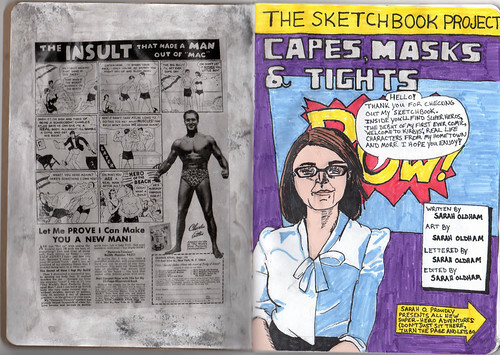 Capes, Masks & Tights Sketchbook: Part I | Oh Sarah O ! Today my latest sketchbook for the Art House Co-op's The Sketchbook Project is visiting my hometown, Wichita, Kansas at Wichita State University's Ulrich Museum. My fifth sketchbook for the co-op, titled "Capes, Masks & Tights" is embarking on a four city tour of the same name which will also travel to Santa Fe, New Mexico (September 29 @ The Santa Fe Art Institute); Boulder, Colorado (October 1 @NoBo Arts District); and Brooklyn, New York (October 11-13 @The Brooklyn Art Library). Sticking with the theme, I drew influences from my hometown, vintage comic books, pop culture, and my comic book heros- R. Crumb, Dan Clowes and Craig Thompson. If you're able to catch the tour the call number for my sketchbook is 220.5-8. 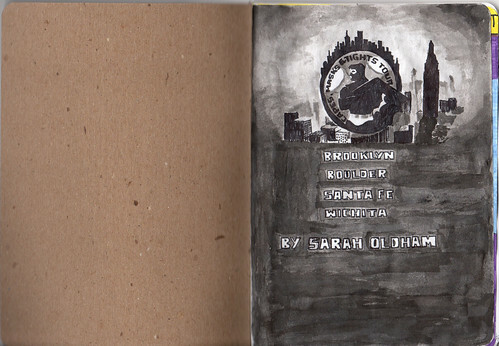 And if you can't catch the tour, I've posted the first 7 pages of my sketchbook below. 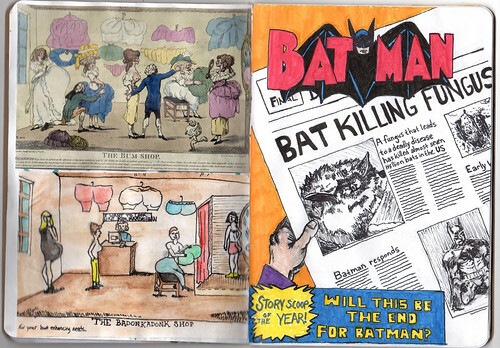 My cover page was inspired by the Capes, Masks, and Tights promotional graphic (seen here). I used sumi ink and black ink pen to recreate the image. I recently received an e-mail informing me that the tour dates and locations have been changed and while the sketchbook is touring in Wichita right now, it will be embarking to New Albany, IN, Columbus, OH and Pittsburgh, PA next. To me, no vintage comic book would be complete without a Charles Atlas ad, so I Modge Podged one into my sketchbook. The page on the right was inspired by a page in Avengers Issue 1.5- a later released spoof issue released in 1999. 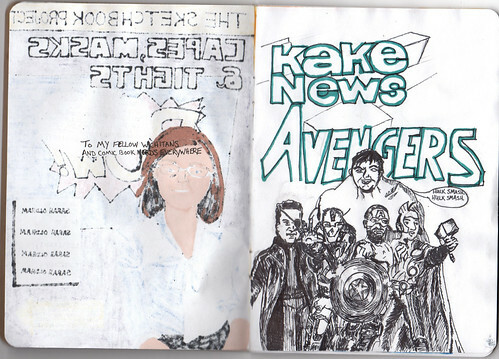 On the left I dedicated my sketchbook "To my fellow Wichitans and fellow comic book nerds everywhere." The page on the right was inspired by this YouTube video. The top left illustration is from an illustration I saw at the Holburne Museum in Bath. I decided to update the illustration for the "Kim Kardiashion age". The drawing on the left was inspired by some headlines I read about online on the BBC.